Gow earned certifications from both the prestigious Wat Po Massage & Medical School (Thailand) and The EastWest Collage of Massage Therapies (Australia.) 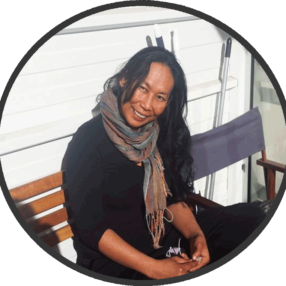 In addition to being a fully qualified Remedial & Sports massage therapist (Health Fund Rebates & HICAPS available), Gow is skilled in a wide array of techniques including traditional Thai massage, Shiatsu, Reiki, Essential Oil and Crystal Therapies. Gow will tailor the massage to best suit you, employing a combination of all her healing arts. You can look forward to the use of many different techniques as she applies her broad experience and knowledge to bring about the best healing outcome for you. Gow uses organic massage oil and essential oils. She has a broad understanding of the medicinal properties of essential oils and uses these to great effect (where appropriate and safe to do so) within the massage at no extra cost, if you wish her to do so. Please note: Miss London, my beautiful guide dog will be present in the room during consultations. I have known Gow Tan for almost ten years and had the pleasure of meeting her before she eventually lost her sight and was told she would officially become blind. Since the loss of her sight she has gained an extra and intuitive sense in regards to being able to perceive the best needs for her clients, whether it be through reiki, traditional massage, deep tissue massage, crystal and stone therapy or just being around her amazing energy which is healing in itself. Gow Tan is a true healer in every sense of the word and able to help you whether it be physical, emotional, mental or spiritual healing that you are in need of. I have seen her many times over the last few years and always leave feeling cleansed, lighter and released from bad energy and physical pain. Gow Tan will cater to your needs. She is gentle, kind , sincere and deeply intuitive as to what is going on in your mind, body and spirit. All essential oils that are used are natural and non toxic. She is a master in Reiki and even without being touched physically you can feel the healing power that radiates from her hands. Some people sleep, some release suppressed emotion, some find release from physical pain and injury. She is able to identify the areas in your body that need work. Gow is a deeply intuitive and beautiful lady and I highly recommend you visit her. She is a fantastic listener and able to cater to a variety of needs. Gow is non judgemental and radiates love and genuine care for her clients. Sometimes you may be accompanied by her gorgeous dog Miss London who will also shower you with love. I highly recommend her!